Daily Masses (Mon-Sat): 7:00 a.m.
Sunday Vigil (Saturday): 4:00 p.m. Interested in joining? Please fill out the registration form in the bulletin and drop it in the collection basket or mail it to the office. You can also email your name, address, and phone number to icstwencpa@diodav.org. We look forward to meeting you! Sundays: 7:30-7:45 a.m. and 9:30-9:45 a.m. Contact Fr. Beckman at least 9 months in advance of preferrred date. AHG Troop IA0928 is selling cookies as a troop fundraiser. Order yours today! 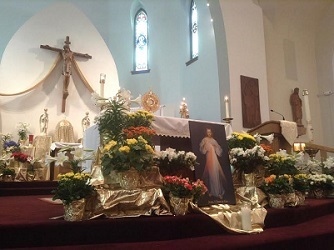 All are invited to pray the Divine Mercy Novena given to St. Faustina by Jesus Himself!